There are haters in the world that can’t stand the idea of sweet and savoury in the same dish – although I’m guessing if you’ve intentionally come to a recipe for a watermelon salad you’re not in this camp – but for the rest of us, this is a brilliant way to have a light lunch or dinner in our lives that is refreshing on a hot summer’s day. Where this watermelon salad really comes into its own though is its textures and flavours: there’s sweetness, saltiness, pepperiness, sharpness and tanginess (that last one’s totally a word, right?). Basically, all the good stuff. You can put this salad out on the table as a side. You can have it as a meal on your own. Eat it in the cool of your house or the sun-drenched bliss of the garden. 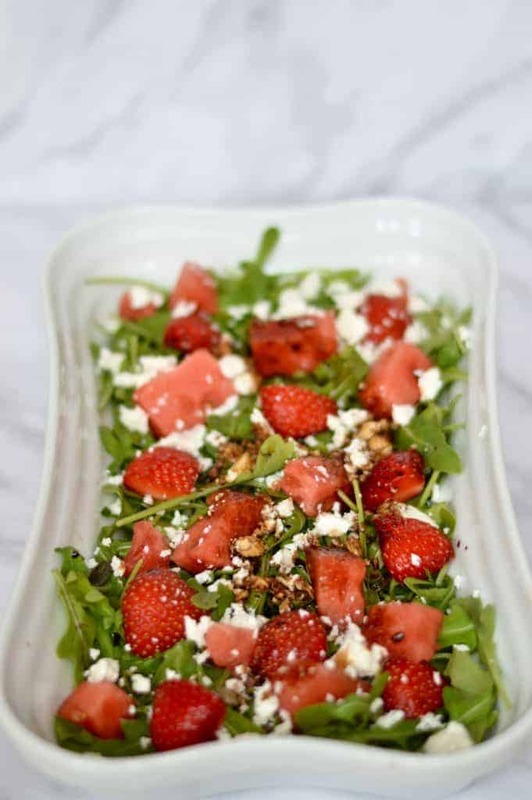 It’s perfect for sharing at lunch or at dinner and also pairs nicely with a crisp, dry white wine or a glass of watermelon sangria. A suggested serving would also include friends and lots of laughter. It’s easy to make this dish, so do it fresh and eat it on the day you make it. Watermelon has a habit of turning to liquid once chopped, and this will wilt the rocket. Sounds fancy and hard to make, right? But really, it’s a piece of cake – it’s essentially reduced down balsamic vinegar. I tend to make a little batch and then use it on salads and such like. Take the balsamic vinegar and put it in a small pan over a medium-low heat. Let it slowly boil and reduce. You want it to reduce to about half the original volume, but watch it and stir it, you’re looking for it to thicken (which will also sweeten in), but it’s quite easy to burn if you’re not watchful. 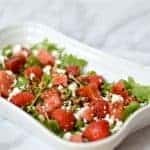 This watermelon salad is one I like to make on a hot, sunny day when I know we’re not going to want to eat too much, but will still want something. It’s sweet, salty, peppery, tangy and just all round delicious. Serves 2. Double check if you need to wash any of the ingredients, and do so if need be. Make the balsamic reduction – put your balsamic vinegar in a pan on a medium heat and let it start to boil and reduce down until it’s about half of the original volume. Chop the watermelon into bite-sized pieces. Half or quarter the strawberries, depending on how large they are. 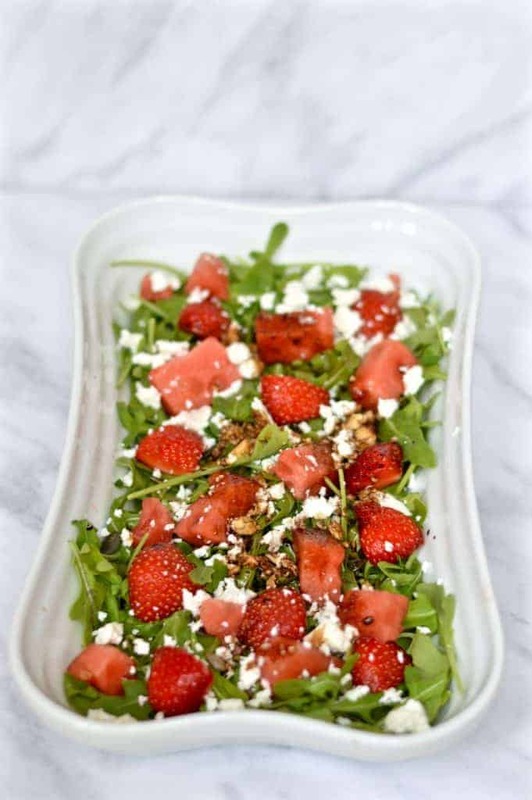 Add the lettuce to your serving dish, top with the strawberries, seeds and watermelon. Mix well. Crumble the feta on top. Drizzle over the balsamic glaze. Serve immediately – a glass of wine on the side is optional!